Our review: Light golden straw, this wine has aromas of freshly cut apple, herbs, with slight tree fruit floral notes. Crisp and edgy on the palate, the fruit flavors quickly smooth out, developing a bit in character. A mineral slateness appears in the moderately long finish. 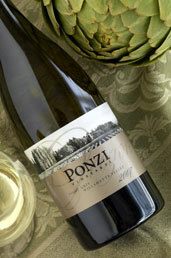 Our rating: This is a very nice example of this varietal from Oregon. Likely to be very food friendly, we served our bottle with Asian cuisine, though it would pair very well with grilled chicken or fish. We rate it on the very high side of Above Average.